Humanities Data Visualization, a workshop held at Georgia Tech from March 2nd to March 4th, brought together leading humanities scholars with visualization designers and researchers to explore a range of meanings of humanities “data,” and to prototype new methods for their visual display. The goal was to encourage these otherwise unlikely collaborators to imagine new forms and platforms capable of portraying the humanistic dimensions of culturally significant data– an increasingly important challenge in the fields of digital humanities and information visualization alike. The workshop facilitated a process of research through design. 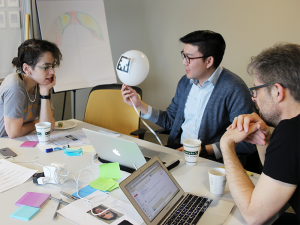 Participants worked in interdisciplinary 5-7 person teams to prototype a visualization of one scholar’s humanities data. The teams focused on developing sketch visualization prototypes for data sets of unusual cultural import and complexity. Six graduate students participated in the event, and it was a great opportunity for them to work closely with some of the top people in this emerging area of theory and practice. Humanities Data Visualization has been generously funded by Georgia Tech’s GVU Center, the Institute for People and Technology, the School of Literature, Media, and Communication, and the Ivan Allen College of Liberal Arts, and the Intel Center for Social Computing (ISTC-Social).